A genomic region using the syntax chrom:start-end (e.g., 22:46615715-46625880). WebSTR is currently based on hg19/GRCh37 coordinates. If you enter a gene name that is invalid or cannot be found, an invalid genomic region, or a genomic region spanning more than 1 Mb, you will receive an error message. A valid search will take you to a region-level page. The top of this page displays the exon/intron structure of genes in the region. Arrows next to the gene names represent the template strand of the gene relative to hg19. Each dot represents an STR in the region, color-coded by the motif length (gray=homopolymer, red=dinucleotide, gold=trinucleotide, blue=tetranucleotide, green=pentanucleotide, and purple=hexanucleotide). Hovering over an STR will display the coordinates and motif. Clicking an STR will take you to the STR page for that locus. The bottom of the page displays a table of all STRs identified in the region. It includes the coordinates (hg19), motif sequence, and length of the repeat in the reference genome. STR pages (e.g. see example) provide locus-level information gathered from various genome-wide studies. 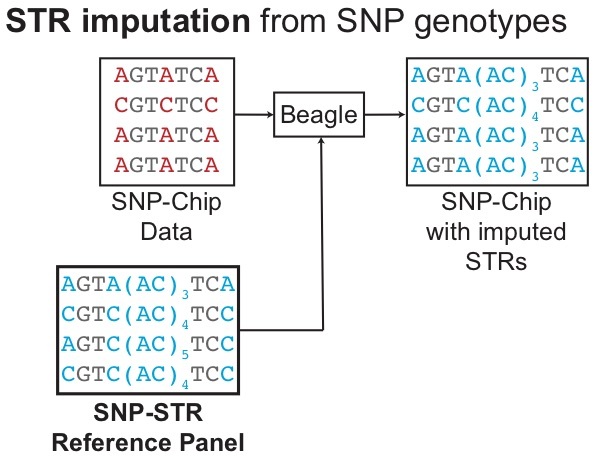 By default, the sequence of the STR (red) and its genomic context (black, +/- 120bp) are shown. Other data panels (Expression STRs, Mutation and constraint, and STR imputation) can be displayed or hidden by clicking on the respective black title boxes. These panels are described below. In this study we analyzed STRs in whole genome sequencing data from the Genotype Tissue Expression (GTEx) Project for 650 individuals and gene expression across 17 tissues to detect STRs whose lengths are correlated with expression of nearby genes (termed "eSTRs"). We further used CAVIAR to fine-map associations for individual genes against nearby SNPs to identify eSTRs most likely acting as causal variants. The figure below shows a schematic of the study design. Tissue: the tissue where the association was identified. If a given eSTR was detected in multiple tissues, each tissue is shown on a separate line. Beta: the regression coefficient obtained by regression normalized gene expression values on normalized STR length. Positive beta values indicate longer STR lengths are associated with higher gene expression, and vice versa. Beta squared can be interpreted as the percentage of variance in gene expression explained by STR length. P-value: the p-value for the regression analysis, testing the null hypothesis that beta is equal to 0. CAVIAR: posterior probability of causality obtained by performing CAVIAR fine-mapping analysis against the top 100 nearby SNPs. In some cases, certain STRs either weren't analyzed or did not have any significant eSTRs, in which case no data is shown. Full details of eSTR analyses can be found in Fotsing et al. In this study we formulated a novel STR mutation model based on a mean-centered random walk and used this model to estimate key parameters of STR mutation at individual loci. We then used this model to compute per-STR estimates of mutational constraint by comparing observed to expected mutation rates at each STR. These constraint metrics can be used to prioritize potentially pathogenic variants. For example, mutations at highly constrained STRs (way lower observed mutation rate than expected) may be indicative of a pathogenic mutation. The following data is shown for each STR. Notably, constraint scores were only computed for STRs with motif lengths 2 and 4, and some loci for which optimization of our likelihood model failed no mutation information is available. Beta: Length constraint parameter (between 0 and 1; note different than the beta above for eSTRs). In general, short alleles are more likely to mutate to long alleles and vice versa. A beta value of 0 indicates no directional bias, whereas a value closer to 1 indicates a strong directional bias. Constraint: Z-score describing STR constraint. Negative values indicate strong constraint (lower mutation rates than expected). Positive values indicate hypermutable loci. Values near 0 indicate loci with mutation rates close to expected. Stutter noise parameters: describe parameters of the stutter noise model at each STR inferred from PCR-free WGS. Full details are available in Gymrek et al. 2017. We generated a reference haplotype panel for imputing STR genotypes into SNP genotypes (either from WGS or from SNP arrays). The panel is based on WGS for quad families from the Simons Simplex Collection, which consists of individuals from various ancestry groups but is majority European and thus will have better performance for similar ancestry cohorts. When available, the imputation metrics described below are available for each STR. These metrics give an overall picture of how well imputation of each STR will work across various ancestry groups. r: Pearson correlation between STR lengths obtained by HipSTR vs. by imputation. r2: Pearson r2 between HipSTR vs. imputed genotypes. Full details are available in Saini et al. 2018 and the haplotype reference panel based on 1000 Genomes samples is available here. WebSTR was developed by Richard Yanicky and Melissa Gymrek with input from other Gymrek Lab members. It is heavily based on and inspired by the Exome Aggregation Database (ExAC). Gene plots were generated using plotly. WebSTR development was supported in part by the Office Of The Director, National Institutes of Health under Award Number DP5OD024577 and by SFARI Explorer Award Number 515568.